Drawing from two masterful works by John Owen, this book takes dead aim at the heart of ongoing sin. This book takes dead aim at the heart of ongoing sin. 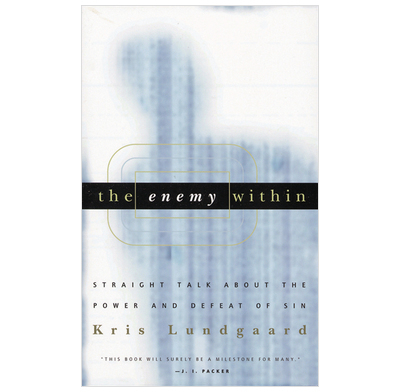 Drawing from two masterful works by John Owen, Kris Lundgaard describes the struggle that every believer has with sin, but also offers insight, encouragement, and hope for overcoming the enemy that we all face. The one area of Biblical teaching that we all tend to minimize is the doctrine of indwelling sin. This book will cure you of that problem, but not in a way that will leave you hopeless and discouraged. The Enemy Within is as honest as anything you will ever read about the power of sin, yet it is infused with the hope of the Gospel." Paul David Tripp, Lecturer in Practical Theology at Westminster Theological Seminary. This book is well written and very easy to understand. It provides very honest and real guidance about the power and deception of sin in our lives, always referring you back to the Bible and giving poignant examples of ways in which it can and does so easily deceive us. It has been a real challenge to read, the truths about sin are hard to take; yet this book provides much needed good and honest teaching, I would recommend it a million times. It tackles the apathetic approach the we so often have to sin and urges us on in our battle against it, always coming back to the cross and Jesus' victory there, always pointing us to the Bible and bringing us back to the hope and strength we can find in God. In my ongoing struggle to overcome sin, this book has been one of the greatest helps. The language is clear and the illustrations are right up to date. I would strongly recommend this book.